Deputy Prime Minister and Minister of Finance Peter Turnquest has released a statement regarding the International Monetary Fund's recent 2019 Article IV Mission report. Read the full statement and report here. It is clear from the IMF’s initial Article IV assessment that the reform agenda of the Prime Minister Dr Hubert Minnis-led administration is moving the country in the right track. The economy is getting stronger. The fiscal measures to raise revenue and contain expenditure are bringing the nation’s public deficits down in line with an articulated and published plan. The financial affairs of the country are stabilizing and the economy is expanding after years of stagnation; this is setting the stage for sustained economic growth and shared prosperity across The Bahamas. As I consistently point out, there is still much work to do. In respect to public finances, there remains a need to ensure expenditure containment, focusing new expenditure only on critical matters and key elements of our electoral mandate. There must be continued emphasis on improving revenue collection from existing tax measures. Continuing the reform agenda, my Ministry will within this calendar year put out for public consultation and eventual Parliamentary consideration, the referenced draft legislation on public procurement, and a brand new expansive framework for public sector financial management. These are critical to bolstering transparency and accountability in government – which are linchpins for sustained fiscal stability and efficiency in public expenditure. The institutions responsible for nominating members to the Fiscal Council have been requested already by the Speaker of the House to provide their nominees to this body. The Fiscal Council will thus be formed and in place within the time parameters outlined in the law. The Council will be provided the resources within the upcoming budget to undertake their oversight responsibilities. I appreciate as well the commentary in relation to the need to continue the structural reforms necessary to boost the competitiveness of the Bahamas. The government will continue both to expand the access to capital by Bahamian entrepreneurs, and to remove bureaucratic impediments to Bahamians doing business. Carrying over from this year’s budget, one can anticipate that the government will continue to increase its investment in education and training, recognizing that preparing Bahamian young people for an increasingly competitive global marketplace must be a pressing priority. 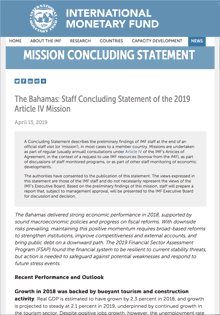 Read the full IMF report here: Staff Concluding Statement of the 2019 Article IV Mission. The Bahamas Ministry of Tourism and Aviation recently participated in the AIRLINE Networking Conference in London. Minister of Foreign Affairs Darren Henfield led a delegation from The Bahamas to Miami, Florida, for a one-day Ministerial Meeting that resulted in the launch of the US-Caribbean Resilience Partnership April 12, 2019.